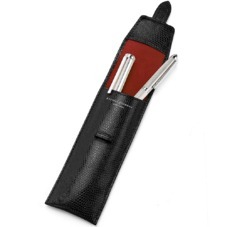 Store and protect your favourite writing pens in style with our Small Pen Case. Handmade from the finest Italian calf leather and lined in soft suede, this slimline leather pen case is suitable for storing two slim pens. It has a semi-structured design and is secured with a tab closure.